Tamilnadu Adi Dravidar and Tribal Welfare Department recruitment 2018 – Tamilnadu Adi Dravidar and Tribal Welfare Department recruiting 05 candidates to fill their Office Assistant job in Tamilnadu. Aspirants are requested to go through the latest Tamilnadu Adi Dravidar and Tribal Welfare Department job recruitment 2018 fully, Before applying to this job. Tamilnadu Adi Dravidar and Tribal Welfare Department career is comes under the Government job. This is the best opportunity for the job hunters who are looking for the Career in Tamilnadu Adi Dravidar and Tribal Welfare Department. Tamilnadu Adi Dravidar and Tribal Welfare Department organization job applications are collected by offline mode only. Tamilnadu Adi Dravidar and Tribal Welfare Department inviting the Office Assistant job offline applications from 24.05.2018 to 02.07.2018. The interested and eligible candidates can able to apply for this job easily. Do not miss the wonderful career opportunity in Tamilnadu Adi Dravidar and Tribal Welfare Department . The detailed information on Tamilnadu Adi Dravidar and Tribal Welfare Department latest job notification 2018 has been given below. The job hunters are requested to read below the Tamilnadu Adi Dravidar and Tribal Welfare Department job selection process, eligibility, salary, age limit and applications fee in our Tamilan Jobs website. Aspirants stay tuned in this page for upcoming changes in Tamilnadu Adi Dravidar and Tribal Welfare Department Office Assistant job 2018. For more accurate information on this Tamilnadu Adi Dravidar and Tribal Welfare Department job notification, check their official website www.tn.gov.in. Tamilnadu Adi Dravidar and Tribal Welfare Department has released the following vacancy details with their recent recruitment. They give huge surprise to the candidates. They invites 05 Candidates to fill their vacancies. You can check their job vacancy details by below. Tamilnadu Adi Dravidar and Tribal Welfare Department requires following posts to fill their vacancies. Check the latest job vacancy details below Tamilnadu Adi Dravidar and Tribal Welfare Department 2018. As per the recent Tamilnadu Adi Dravidar and Tribal Welfare Department notification 2018, the eligibility details for the Office Assistant job has given below. Its is very important to check you qualification for this opportunity. If you have less qualification, you may not able to apply for this career. Here below you can find age limit and educational qualification required for Tamilnadu Adi Dravidar and Tribal Welfare Department Office Assistant job 2018. Candidates are requested to check their education qualification required for various Tamilnadu Adi Dravidar and Tribal Welfare Department job opportunities. Candidates who have completed 8th, 10th or equivalent from a recognized Institute are Eligible to apply for the recruitment 2018. To apply Tamilnadu Adi Dravidar and Tribal Welfare Department job, the candidates required to attain following age limit. The notified aged candidates only can able to apply for the job vacancy. check the age limit details below. For more reference kindly check the Tamilnadu Adi Dravidar and Tribal Welfare Department official notification 2018. As per the latest Tamilnadu Adi Dravidar and Tribal Welfare Department Notification 2018, there is no application fees to apply this 05 Office Assistant job vacancy. So The candidates go for another step. 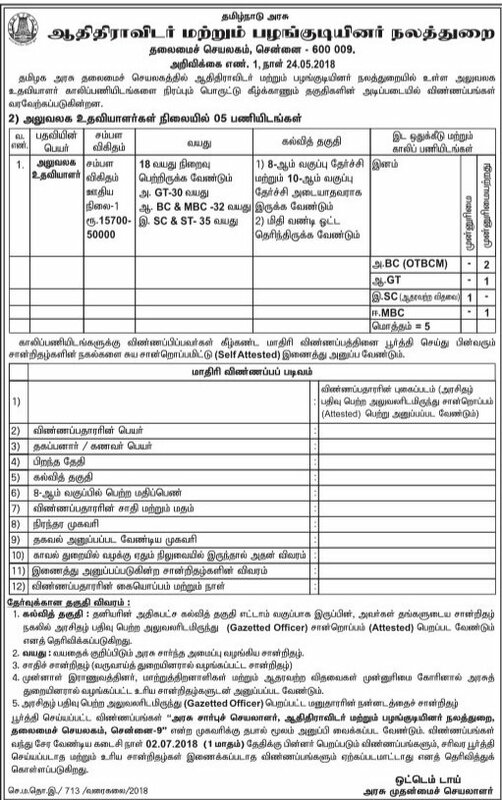 Tamilnadu Adi Dravidar and Tribal Welfare Department 05 Office Assistant Job salary details has been given below. The candidates can check various salary information below. Tamilnadu Adi Dravidar and Tribal Welfare Department may follow the following process to select the candidates. For Accurate information check the official website. How to apply for Tamilnadu Adi Dravidar and Tribal Welfare Department Recruitment for Office Assistant Job? Step 4: Check and verify your eligibility to Tamilnadu Adi Dravidar and Tribal Welfare Department Recruitment 2018. If you are not eligible for the job notification, ignore and leave space for others. Step 9: All the documents should be addressed to “Address Mentioned in Official Notification” by post so as to reach to the notified Tamilnadu Adi Dravidar and Tribal Welfare Department address on or before 02.07.2018. Envelope must be superscribed with “APPLICATION FOR THE POST OF “…………….”. அரசு சார்பு செயலாளர், ஆதி திராவிடர் மற்றும் பலங்குடியினர் நல துறை, தலைமை செயலகம் சென்னை – 9. The following important dates need to be remembered by the Tamilnadu Adi Dravidar and Tribal Welfare Department candidates. Tamilnadu Adi Dravidar and Tribal Welfare Department Notification 2018: click here! Tamilnadu Adi Dravidar and Tribal Welfare Department Recruitment Application form: Click here!